"Meet Rocky! He is a 22-lb., 16-inch tall, 2½-year-old rescue dog from the Plainfield Humane Society. They rescued him from a shelter down in southern IL where ’his time was up.’"
"He is THE best dog! He's fun, playful, cuddly, rarely barks, and LOVES people, especially the ladies! They said he's a terrier mix, however, he has characteristics of Beagles and Dachshunds. People think he looks like a mini shepherd, but his legs aren't very long. He's pretty much a lap dog also. Sometimes he even acts like a cat, where he needs to be up high, looking down. He curls up like a cat, too." "His life is ruled by his nose, as he constantly sniffs. He will fetch a ball, but will NEVER give it up. He has to keep it. If another dog has a toy, he HAS to get it. Recently, he discovered his ’inner digger’ (started to dig outside). That makes me think he has some Dachshund in him. And he rolls in the grass, A LOT!" "His quirkiest trait is that when he gets a rawhide bone, after he's done licking it and chewing it, he HAS to find a place to bury it. In the house, that's hard. So he walks around with this BIG bone in his mouth, very focused, just searching and looking for corners to put it into. Then he drops the bone and proceeds to push the bone with his nose into the corner, subsequently getting rug burns on his nose and rubbing the black right off!! Then it bleeds and he gets bloods stripes in the carpet!! Then his nose has to heal and grow back. It is the FUNNIEST thing." Rhodesian Ridgeback mix finds happiness with Greyhound mix—"’The Girls’—on the left is Consuela, an 8-year-old Humane Society rescue. Rhodesian Ridgeback / Lab. Very protective and unfriendly. A bully! She has always been aggressive toward any and all dogs, except our Aussie mix, with whom she was raised. They never played together, however. When it came time to find Consuela a buddy, after our Aussie mix passed on, I took her back to the Humane Society where she picked out Dexa!, a Greyhound mix. She had tried to bite the first dog we paired her with, but with Dexa!, she found her soul-mate at first sniff! Both weigh in at 50+ lbs. Finding Dexa! has been a life-changing experience for Consuela. Dexa! translates as "Take that!" (said to have been shouted by Ancient Greek soldiers). She is 1-1/2 years old and a true sweetheart. Calm and quiet, she has learned commands quickly so far. We live in desert Wyoming, and she has discovered the thrill of chasing rabbits over miles of sage brush. Consuela and I can't keep up and often must follow her in the truck. She is learning to return by voice command, or is it simply that I have the water bottle? Best of all, Consuela adores her: no bites, growls, or jealousy! Just cuddles and kisses. Never thought I'd see the day." "These are my two Shar-Pei / Retriever sisters adopted from the pound. They were found as very young puppies, walking along the freeway together. They are littermates, but couldn't be more different! Kazu (the black one) is very loyal, follows me around the house, gazes at me, etc. She's very excitable and has trouble—after 5 years—understanding that jumping when someone comes in isn't okay. She's a very happy dog who even wags her tail when she eats." "Wanda (the white one) seems more like a Shar-Pei. She's quite aloof and bossy. Her affection is on her terms and she's the only dog I've ever seen who sulks. She does love to play, however, and frequently brings her rope to me, wags her tail, looking for some playtime." "This is my dog Mango. She is a three-year-old ??? (possible Pharaoh Hound mix). No one is really sure what breed. I found her under a bridge in the Dominican Republic, when I was there for the Peace Corps. She is a happy, healthy dog with WAY too much energy. 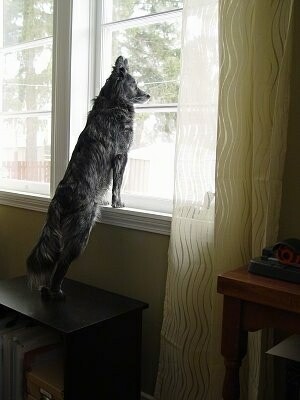 She tends to bound around the house and the yard, preferring to leap over furniture than around it. She is also unable to walk on our hardwood floors. You can tell when she is coming because there is a pound, pound, pound, skid, slide, scratch, BANG, pause, pound, pound, pound. Her tail is also a dangerous weapon. I don't think she has any feeling in it and tends to beat guests about the knees." "Here is my 2-year-old Beagle mix Sandy. She is very obnoxious, and loves to make a fool out of herself! She hates strange men who come to the door; she goes nuts! Whenever you bend over to hug her, she does a ’lust growl’ but then as you ease away, she whines! 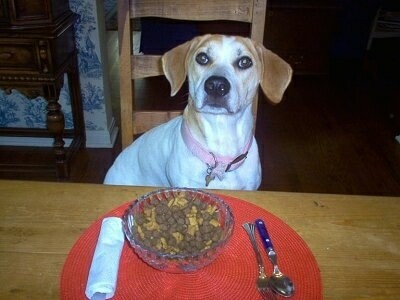 She loves to perform tricks, and eat at the table (as shown above)." "This is Harley. He is a German Shepherd, Border Collie mix. He is about 5 years old in this picture. He is an all-out friendly dog. He loves people of all ages. He is even great with kids! You can take him anywhere and people he has never met can come up and pet him. He won’t bite or growl. He will only kiss! He loves to give kisses! He will just cover you in kisses! Although he isn't the best guard dog he is a great companion dog!" "Hi! My name is Capone, but unlike my name, I am a sweet 20-month-old pup. I am an Australian Cattle Dog mix. I do like to be the big tough guy when I am at the dog park with my Mommy. Sometimes I think I'm a Great Dane even though I only weigh about 36 pounds. My mommy says I am very smart, seeing as how I taught myself how to open and close doors, and I know a few tricks too! I also know the name of my toys, although I chew through them pretty quickly—even the ’Combat tested material’! I love to chase and herd...usually another big fluffy dog, which I think look like sheep. I'm a really good guard dog, and I always let my mom know when someone is at the door (or walking by, or when there's a squirrel, or really anything that moves.) I went to puppy school and learned how to behave because I used to be out of control, but Mommy knew that I just needed some rules. I don't really remember it, but when I was very small (about 4 months) I was found in a cage too small for me and sent to a rescue place, where Mommy's brother adopted me, and gave me my name... The stupid people at the apartment where he lived didn't like my barking and I was too scared to be cage trained, so I was almost given back to the pound. But Mommy didn't want me going back to that, knowing that I wasn't good to be adopted yet, so she saved me and got me all trained up! My Mommy loves me very much! I have an older brother, Sarge who is a grumpy old Beagle who doesn't like to play with me, but that's what the dog park is for!"